A little agency where BIG stories are born. 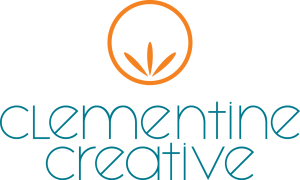 Clementine Creative is a boutique design agency that delivers big results by combining comprehensive know-how with the flexibility, creativity and personal attention of a small shop to offer full-service marketing solutions. Marietta Square Market is a landmark new food hall destination adjacent to the vibrant Marietta Square in historic Downtown Marietta. Repurposing an 18,500 square foot warehouse space right along the rail line and multi-purpose pathway that tracks through Downtown, Marietta Square Market will evoke the history, character and vitality of its surroundings in a friendly, fresh gathering spot. From its iconic restored trolley car to its curated selection of unique food concepts, Marietta Square Market celebrates the creative, artistic and uniquely local heritage that has made Marietta Square a thriving and sought-after destination. The most engaging element of the logo, the monogram, infuses Deco inspired lines, a style reminiscent of grand train stations, where two Ms are linked by a single square shape. Furthermore, the symbol also resembles a bird’s eye view of a train traveling down the tracks where the two legs of the large M resemble train tracks and the apices of the M join to form the pilot. We've placed the monogram inside a vintage-style badge with artisan slab lettering, creating an inviting and fresh icon with a nostalgic essence. The addition of the fork and spoon further accentuate the brand's intention at this soon-to-be landmark location.